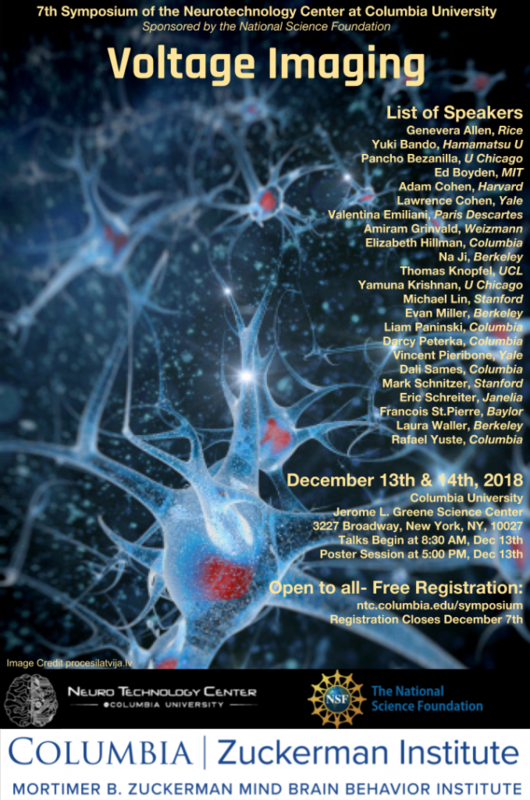 On Thursday December 13th and Friday December 14th, 2018 we will hold the 7th Symposium of the Neurotechnology Center at Columbia University on the topic of Voltage Imaging, sponsored by the generous support of the NSF and Zuckerman Mind Brain Behavior Institute. The symposium will feature talks from selected leaders in the fields of voltage imaging, voltage sensors, optics, and computation. We will examine key questions and challenges of this field while at the same time review new methods and experimental and theoretical tools. These new methods could launch a new wave of research in this critical area of neuroscience, and push through the experimental challenges to arrive at a first understanding of how neural circuits compute. All attendees are invited to join us for breakfast starting at 8am as well as lunch at noon both days and a poster session and reception from 5-7pm on the 13th. Talks will begin at 8:30am. Upon clicking submit, you will be directed to the abstract submission page (abstract submission is optional). Thank you for your interest in the 2018 NTC Symposium: Voltage Imaging, unfortunately the registration list is already full.